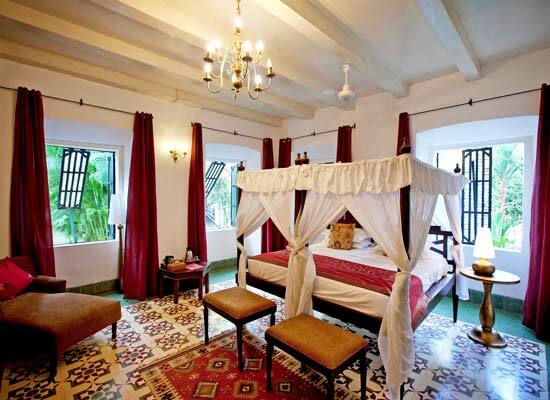 "The Siolim House, Goa is a 17th-century Indo-Portuguese Manor which has become a beautiful heritage hotel in Goa. 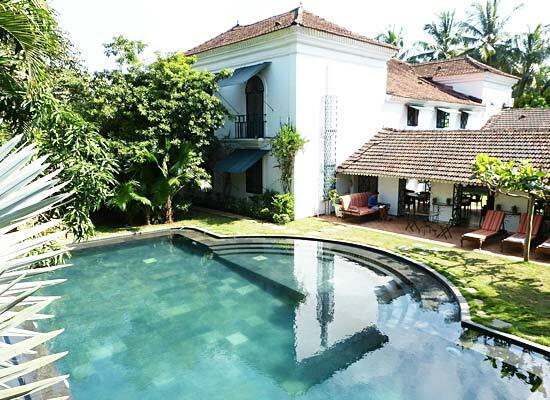 It is tucked away in the charming village of Siolim. The palatial 300-year-old house belonged to the Governor of Macau. It has been lovingly restored from ruins and the careful attention to detail has earned it a UNESCO Heritage award nomination. Get back to the Portuguese Goa. Rooms are splendid. The setting laid-back and homely. Spend time in the lovely gardens, the village or the nearest beach. The food is heavenly, fresh from the gardens cooked in traditional style. Enjoy the simple luxuries of rustic Goa. 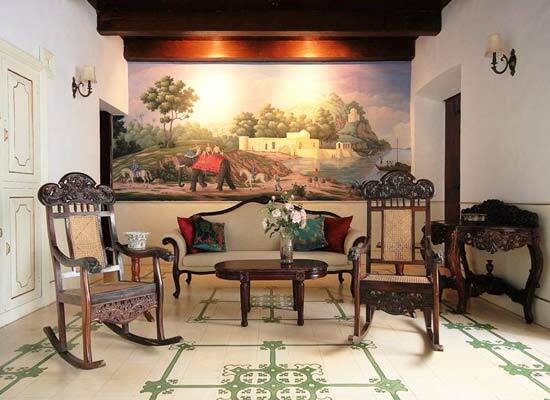 The history of Casa Palacio Siolim House, a popular heritage hotel in Goa, is 350 year old. It was built in 1675. 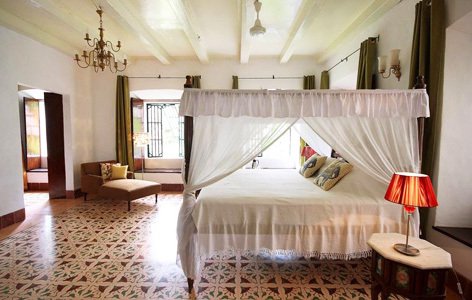 Built in the early days of Portuguese occupation in Goa, this Palacio has been restored as a home, which now doubles as a private seven room heritage boutique hotels in Goa. 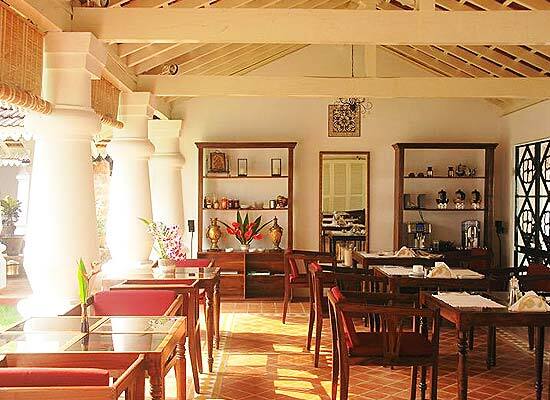 The hotel exhibits ‘casa do sobrado’ style of Goan-Portuguese architecture remaining in North Goa. The manor once housed the governor to Macau. In 2001, Siolim House was a finalist for the UNESCO World Heritage Site. In 2009, Siolim House underwent a second renovation for more detailing. 10 in number, the guest rooms at Siolim House are comfortable, spacious and come equipped with a range of modern amenities such as cable television, telephone, free Wi-Fi internet connection, tea & coffee maker, DVD player and attached bathroom with bathtub and hot & cold water. These rooms are segregated as Macassar Suite, Macao Suite, Malabar Suite, Surat, Damao, Cambay, Bahia, Frangipani, Little Siolim Superior Room, Little Siolim Room 2 and Little Siolim Room 3. The hotel has an on-site restaurant which offers a scrumptious variety of excellent home-styled food using the best local produce, and prepared by Goan chefs. The chefs at the hotel offer freshly cooked meals and the hand-picked seasonal vegetables & fruits from the local produce. The specialty of this restaurant is the service of customization of food to the liking of its guests. Goa, a popular Indian beach state, is visited by tourists in large numbers. It houses a large number of people from Christian community. It is replete with numerous sightseeing spots and churches & cathedrals. Goa is a place that invites beach lovers, adventure enthusiasts and family holidaymakers too.